Twelve-year-old Michael Arroyo has had one dream since before he came over to America on the boat from Cuba: to play in the Little League World Series. He's good. He's very good. And his Papi has always believed in him. But the road to the World Series isn't smooth. And Michael's got a secret that he's desperate to hide. His Papi has been dead for two months. His older brother Carlos is trying to keep them afloat by working two jobs, but the bills are piling up and the brothers aren't sure how much longer Michael's coach is going to believe that their dad is in Florida taking care of a sick uncle. They live in fear of "Official Persons". Then a challenge is made. A coach from another Little League team accuses Michael of being too old to play in the league. Michael must present his birth certificate, but he doesn't have it. It's somewhere in Cuba. And Michael has nowhere to turn. 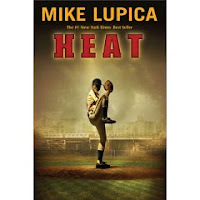 This action-packed baseball novel will be a sure hit with young sports fans. Michael is a likable character that I found myself rooting for (even as I, stodgy grownup that I am, was wishing they would get found out so that some adult would step in and take care of them). Michael's got an obvious passion for baseball and when he plays the rest of the world is stripped away. The novel takes place squarely in the summer months with no complications from school or teachers. I have to admit that I skimmed some of the baseball bits. I like baseball as much as the next guy, but some of the scenes were too steeped in jargon and baseball plays for me to really understand what was going on. It will definitely appeal to young sports players, though, who will see all the sports action as it unfolds. Some of the schemes that Michael and his best friend Manny come up with to protect the Arroyo brothers are far-fetched and the end comes together much too smoothly to be realistic. That said, this is a great book for summer reading. It moves quickly and you get the happy ending that you're looking for in a light, fun read. There's some mild criminal activity (the book starts with a mugging that is foiled by Michael and Carlos is involved in a not-quite-legal operation to make more money), but no drugs or violence. Sports fans will gobble it up.